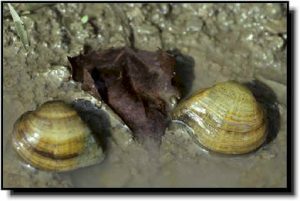 This species is found throughout the Mississippi River system, as well as some tributaries of Lakes Erie and St. Clair and is considered stable throughout most of its range. It is found throughout the Mississippi River system, from western Pennsylvania and far western New York to Michigan and Minnesota, south to Iowa, Kansas, Texas, Louisiana, Tennessee, and northern Alabama. In Canada, it occurs in southern Ontario in the Lake Erie and Lake St. Clair drainages. Comments: This is a very well-marked mussel with a shell showing numerous greenish rays, chevrons or zigzag patterns on a background of yellowish, greenish or reddish-brown. The nacre is white or various shades of pink. It is closely related to the fawnsfoot, but is larger with a more sharply angled posterior margin. It is generally more triangular-shaped which reflects its common name, the deertoe. It can be found in several southeast Kansas rivers and streams. 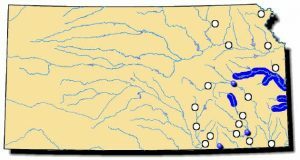 It appears to be rare below some reservoirs, suggesting fish are unable to transport the juveniles to these locations because the dams act as barriers to dispersal.